The 58,196 total represents a rise of 14 per cent over the past seven years, while the number of obese children aged 10-11 rose by almost a quarter to 116,134 last year. The data from NHS Digital shows the problem is worse in poorer areas. Parts of London including Newham, London Haringey, Enfield, Croydon, Brent, Barking and Dagenham as well as Yorkshire and Humber and the North West, show the biggest rise. Areas with the lowest number of severely overweight children include south west England and the affluent London boroughs of Richmond, Wandsworth and Westminster. The figures follow a report by Diabetes UK which estimates the number of Britons developing type 2 diabetes will spiral from 4 million to 5.5 million by 2030. Professor Philip James, founder of the International Obesity Task Force said: “Successive governments have failed to tackle this serious and costly time bomb. Tam Fry, of the National Obesity Forum, said: “These figures are terrible and reveal the current system isn’t working. Despite repeated government efforts and huge amounts of government money poured into tackling this problem we haven’t seen any meaningful results. “The worst thing about these figures is the increasing number of very young children who are obese and getting more obese as they get older. He said children were still not doing nearly enough exercise in schools, were faced with large portion sizes and sugary snacks. Studies showed obese children were about five times more likely to become obese adults. However, Mr Fry said there had been some improvements. Plans to restrict the calorie content of pizzas, pies and ready meals were last year unveiled by the Government. And a tax on added sugar in drinks came into force in April. It forces firms to hand over more of the money they make from drinks containing more than 5g of sugar per 100ml. As a result, many soft drinks recipes have been changed. 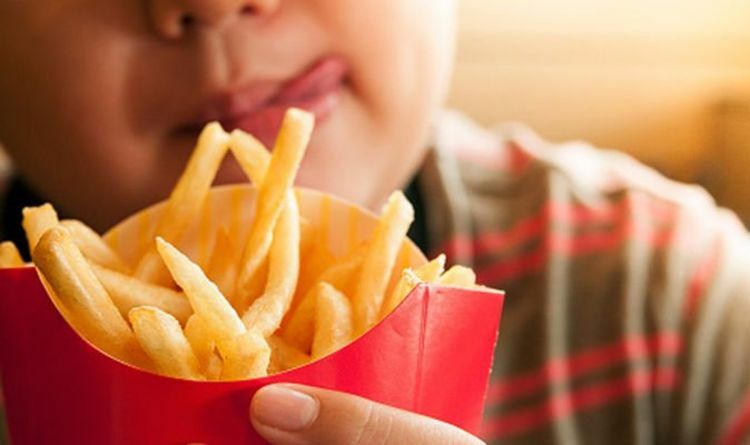 Councils have also been urged to ban fast food vans outside schools, limit the opening hours of takeaway shops near the buildings and reject planning applications for junk food outlets within 400m of a school. In England more than a third of children are overweight or obese by the time they leave primary school and almost two-thirds of adults are also overweight or obese. The Government spends about £6billion a year on treating obesity related conditions. An NHS England spokesman said: “The country’s growing obesity epidemic poses problems for the NHS but is also worrying for the nation’s overall health – obesity in childhood paves the way to obesity in adulthood, and can lead to 11 different types of cancer, heart attacks, type 2 diabetes and other illnesses.